The maximum charge and discharge current is limited to 25A, but the data sheet tells me the maximum is 100A. After charging the battery the charge current often changes between 0A and 25A. The combination of Victron products with Pylontech lithium batteries has been tested and certified by the Victron and Pylontech R&D departments. General information about the battery is found in Pylontech's documentation. This manual is intended to be used in conjunction with the product manual supplied by Pylontech. It provides additional and specific information regarding integration with Victron systems. The Pylontech includes a Battery Management System (BMS) with each battery module. This interfaces with the Victron Venus-device and can support multiple battery modules connected in parallel. It is essential to use the CAN-bus connection of the Venus-device (eg CCGX or VGX) with the batteries for the keep-alive signal, communication of charge and discharge limits, error codes and state of charge. The minimum required firmware version for the Color Control GX is v2.15. It is highly recommended to use the latest firmware version on all connected devices, including CCGX/VGX, Inverter/Charger and MPPTs. There are regular updates to improve performance and reliability. The minimum firmware version is 422. Though updating to the latest firmware is recommended where possible. These inverter/charger units must be connected to the Venus-device via the VE.Bus connection port. For proper operation, the Pylontech battery needs to be able to control the charge current. Therefor it is recommended to use Victron 48V compatible MPPTs models with VE.Direct port for charging. MPPTs are controlled via the Venus-device. Make sure the Venus-device runs v2.15 or later, and the MPPTs to 1.37 or the latest available version. The MPPT requires connection to the Venus-device to regulate charge currents as the batteries require (due to temperature, etc) To test operation, try disconnecting the Venus-device from the MPPT. After a time-out, the MPPT will stop charging and flash an error code on its LEDs. The error code is error #67: no BMS. Use of VE.Can MPPT's with Pylontech batteries is not supported or documented. Each US2000B Plus battery module is approximately 50Ah at 48V, can provide 25A continuous charge and discharge and 100A peak for 1 minute. The charge and discharge rates are managed automatically by the Pylontech battery and Venus-device. Using very large solar arrays with battery banks that are too small can exceed the limits of the batteries ability to charge and possibly lead to the BMS triggering over-current alarms. You must have the minimum number of units to supply the potential current demand of the load connected to the inverter. It is more desirable to have the inverter/charger overload than the battery. Some suggested battery sizings for common Victron inverter/chargers are listed below. These are suggestions for reliable operation for single phase off grid and are not specified by Pylontech. You can connect multiple battery modules together to form a single large battery by connecting the RJ-45 cable supplied by Pylontech using the link ports on the battery. This is shown in more detail in the example wiring diagram and Pylontech manual. The batteries will automatically detect and link to each other, no adjustment of dip switches or software changes are necessary on the batteries. The battery with the empty link port 0 is the master battery. Using the VE.Can to CAN-bus BMS type B Cable, part number ASS030720018, Plug the side which is labeled Battery BMS into the Pylontech CAN port of the master battery. Plug the side labeled Victron VE.Can into the Venus-device. Then, plug a VE.Can terminator in the other VE.Can socket on the Venus-device. Two VE.Can terminators are included with the package of the Venus-device as an accessory, only one is used. Keep the other one as a spare. More information about the cable can be found in its manual. Without properly connecting this cable, the battery will not show up on the display of the Venus-device. The battery will also turn itself off. It is important to ensure this connection and display of the battery on the Venus-device display before attempting firmware updates or settings changes on other devices if they depend on the power supply from the battery. Without this connection, the battery may turn off unexpectedly. You will need the latest firmware on all connected devices. This section presumes familiarity with VEConfigure software. Set the battery capacity to the total capacity of the battery: eg 50Ah times the number of battery modules for the 2000B Plus model. The other parameters (“State of charge when bulk finished” and “Charge efficiency”) can be left to their default setting: They are ignored for a Pylontech installation. Note: make sure to double check the float voltage after completing Assistants, and if necessary set it back to 53.0 V.
* The pre-alarm setting is dependant on your preference and on site specific requirements. You may wish for this to be activated earlier in an off grid situation to allow time to start a backup generator. 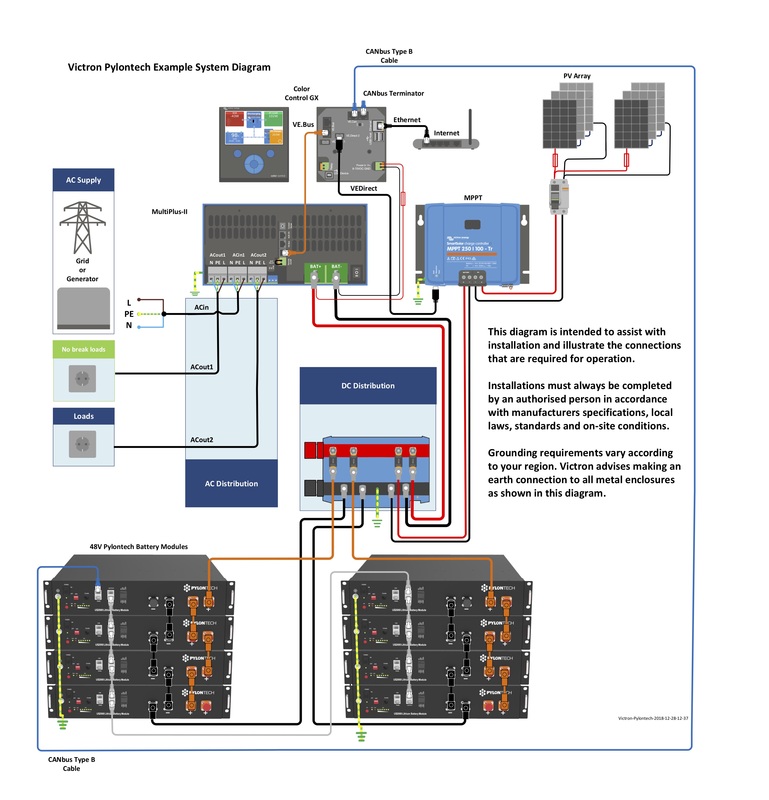 If you are using the battery as part of a grid connected ESS system, please review the ESS Quickstart guide and Design and Installation Manual. Dynamic cut-off values set all values to 46V. Due to the reliability of the grid supply and the behaviour of the sustain voltage threshold in ESS; you may wish to suppress the low voltage pre-alarm warning so that it does not trigger every day on its regular deep cycle. See ESS FAQ Q5 - about suppressing the low-voltage alarm. In normal operation, the charge parameter limits are set by the Pylontech battery and communicated through the system by the Venus-device to the inverter/charger and MPPT. Low Voltage: When the battery discharges to 44.5V or less, battery protection will turn on. High Voltage: If charging voltage above 54V, battery protection will turn on. Working discharge temperature range is from -10 to 50 degrees celsius. Charging temperature range is from 0 to 50 degrees celsius. Discharge Current Limit set to 0A at 47V, inverter will turn off. Over-charge and Over-discharge Current Limit 102A for 15 seconds, 200A for 0.1 seconds and 400A short circuit current. If operation is attempted outside the operating range, the battery will disconnect to protect itself. Select the CAN-bus BMS (500 kbit/s) CAN-profile in the CCGX. Menu path: Settings → Services → CAN-profile. This parameters page is also a good place to check that all batteries are connected and working properly. In normal working conditions, the current limit is 25A per cell. For example, 75A charge current limit ( 75 / 25 = 3 ) means there are 3 Pylontech battery modules connected. In normal operation the MPPT charge characteristics are governed by the Venus-device via DVCC, with instructions from the connected Pylontech battery. The settings below are a precautionary measure. If the system is not operating correctly, go through these steps. As a safety precaution, the inverter/charger will not switch on if the Venus-device is not on. If you are unable to start the system due to a total system blackout / battery shutdown due to low voltage, you may need to disconnect the VE.BUS connection cable between the inverter/charger and Venus-device. You can then start the inverter/charger from an external charge source such as a generator or grid connection. Once the inverter/charger has started, it should supply power to the DC terminals and this should start the Venus-device and Pylontech battery again. You will need to then reconnect the VE.Bus Communications cable back to the inverter/charger and Venus-device. CAN-bus communication cabling between Pylontech and Victron system. Make sure that it is in the right way around. Check the Max Charge Voltage parameter. This voltage parameter is sent, together with the other three parameters, by the Pylontech system via the CAN-bus cable. They are visible on the Venus-device: Device List → Pylontech battery → Parameters menu. The Pylontech manual contains additional diagnostic and troubleshooting information, specifically around decoding any indicator LEDs. The maximum current is limited to keep the battery healthy and reach the 10 year guarantee. In off-grid, the inverter can draw more than the 25A limit to run the loads, make sure you have sufficient batteries installed to keep the load per battery around this limit. This is caused by cell balancing inside the battery. This happens with new batteries and after a deep discharge. Pylontech's BMS will restrict the Charge Current Limit of the battery in cold weather. The precise temperatures and limits are not published by Pylontech, but anecdotally from reports on Victron Community it would appear that batteries begin to be limited below 18 degree C, severely limited below 10 degrees C, and completely restricted from charging below 2 degrees C.
You can confirm if this is affecting your installation be entering the Pylontech Battery menu on your Venus-device, and then the Parameters Menu. This will report the Charge Current Limit (CCL) and Discharge Current Limit (DCL). For information about where to buy or find suitably qualified installers, visit the Where to Buy Page. Further community discussion about installing and using Pylontech and Victron can found at Victron Community, use the topic label 'Pylontech'.